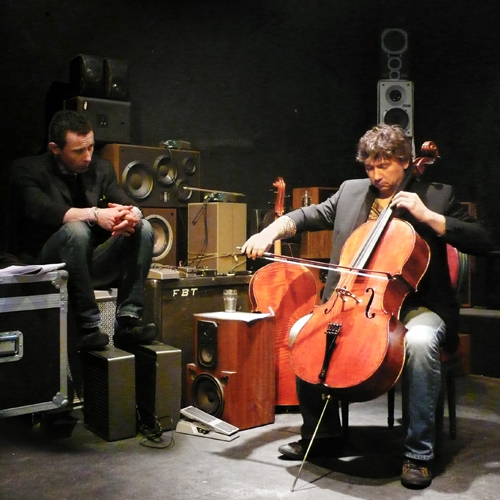 In this musical show, presented at Avignon Festival (2010 official programme), actor Pierre Baux and cellist Vincent Courtois give life to 70s rock’n’roll New York through dialogues, memories, dreams and digressions collected by Legs McNeil and Gillian McCain in Please Kill Me. This uncensored oral history of punk played on stage is haunted by Jim Morrison, Patti Smith, Allen Ginsberg, Iggy Pop, Philippe Marcadé. Baux and Courtois have been successfully working together on very different repertoires – Grimm, Borges, Andersen, Kafka – but they really rock here when celebrating the birth of a new, crazy, revolting, fascinating music!